Full body patient manikins of mid to high-fidelity (as opposed to partial task trainers or basic CPR models) offer unique educational advantages in life support training. The ability to practice urgent, life-saving resuscitation skills on a realistic manikin enhances skills in critical patient care, sometimes delivering greater benefits than traditional teaching methods alone. Physicians, nurses, paramedics and emergency medicine teams who practice critical patient care with simulation tend to demonstrate a noticeable improvement in overall scoring and assessment. 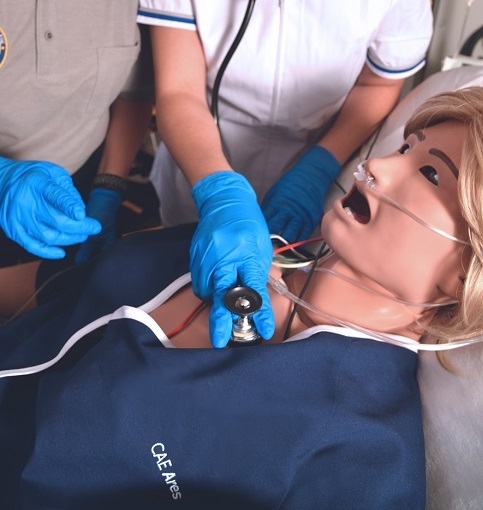 A majority of learners express a heightened degree of comfort, confidence, and competence in their clinical performance after their simulation training. Evidence points to simulation in emergency care training as a viable modality; one that is shown - time and time again - to improve the quality of care provided during actual advanced cardiac life support (ACLS) events, whether out-of-hospital or within the hospital itself. One such study reported an improvement in residents' skills following a simulator-based program. This was a randomized control study that evaluated residents based on ACLS protocols. Months after training, the study found an improvement in residents who participated in simulations. These improvements were sustained over time with little decay, indicating that simulation positively enhanced performance to a greater degree than clinical training alone. CAE Ares additionally can convert completely from male to female with ease. The CAE Ares software includes six Simulated Clinical Experiences (SCEs) that address the four most common EMS alerts: trauma, sepsis, cardiac and stroke for more comprehensive training and education in critical patient care. Patient simulation is a proven, purposeful training tool that allows the learner to practice emergency care under realistic (yet controlled and safe) conditions. CAE Ares is full body emergency care manikin that facilitates emergency care training by presenting a range of essential scenarios, from prehospital to in-hospital care and more. Learn about CAE Ares today. *Okuda, Yasuharu, and Joshua Quinones. “The Use of Simulation in the Education of Emergency Care Providers for Cardiac Emergencies.” International Journal of Emergency Medicine 1.2 (2008): 73–77. PMC. Web. 13 June 2018. Wayne DB, Didwania A, Feinglass J, Fudala MJ, Barsuk JH, McGaghie WC. Chest. 2008 Jan; 133(1):56-61. Epub 2007 Jun 15. Wayne DB, Butter J, Siddall VJ, Fudala MJ, Linquist LA, Feinglass J, et al. Simulation-Based Training of Internal Medicine Residents in Advanced Cardiac Life Support Protocols: A Randomized Trial. Teach Learn Med. 2005;17:202–8.